TC Mag reports OCZ is preparing to launch mSATA editions of its Deneva 2 and Intrepid SSDs, both models are currently sampling to OEM customers. These new solutions target slim servers, network security devices, but also dual drive notebooks and tablets. 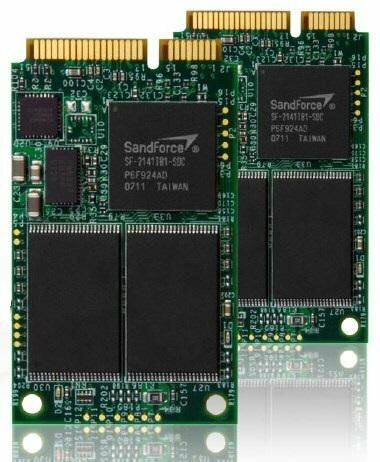 The mSATA-enabled Deneva 2 makes use of a SandForce controller, has 20nm-class MLC NAND Flash memory, a MTBF (mean time before failure) of 2 million hours, TRIM support, and delivers up to 80,000 random 4k write IOPS and a 550 MB/s bandwidth. The Intrepid mSATA drives feature the Indilinx Arowana Flash Transition Layer that provides increased sequential write speeds and IOPS, and the Indilinx Ndurance Technology for enhanced endurance.